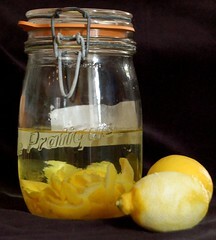 Leave together in well-sealed jar for 8 days. Stir until sugar dissolves, leave to come to a boil, then put aside to cool. Strain the alcohol mixture, combine with the strained syrup, and bottle. Serve chilled (can be frozen and served straight from the freezer)..